I am currently on a tour of Peru with Gabriel Alegría and the Afro-Peruvian Jazz Sextet. The tour, organized by Tour Peru, includes concerts and performances, as well as some typical and not so typical tourist activities. One of the not-so-typical activities was a visit to Peña Don Porfirio, which not coincidentally, included a performance by the band. Here are my impressions of the evening. Many jazz artists, at some time in their career, explore some of the traditional music of their native country. For Gabriel Alegría, and the Afro-Peruvian Sextet, it is more than a simple exploration. It’s a calling. The Peruvian trumpeter and his group use the rhythms of coastal Peru to underpin all of their music, whether it’s an original, or standards such as My Favorite Things. These rhythms, in 3/4, 6/8, and 12/8 time, and the percussion instruments that support them, date back centuries, to when black slaves were brought to Peru to work on plantations. The slaves were denied the use of their own instruments, and so would use drawers, boxes, or whatever they could find, to make music, creating cajóns, cajítas, and other unique percussion instruments. Now, Alegría and his sextet use those instruments to create a polyrhythmic sound that is both traditional and new. On Friday, January 6th, Gabriel and his group performed at Peña Don Porfirio, located in Lima on a side street of the Barranco neighborhood. Like many social halls, tables are arranged in rows, encouraging interaction among all. The room is decorated with balloons and streamers. A large sepia-toned photo of a quintet is on one wall. Portrait photos of other performers are on another. It’s a family run affair. A minimal menu is available, with lomo saltado (a delicious plate of beef, tomatoes, and potatoes) being the specialty. The beers are cheap, the food is good, and conviviality is in abundance. 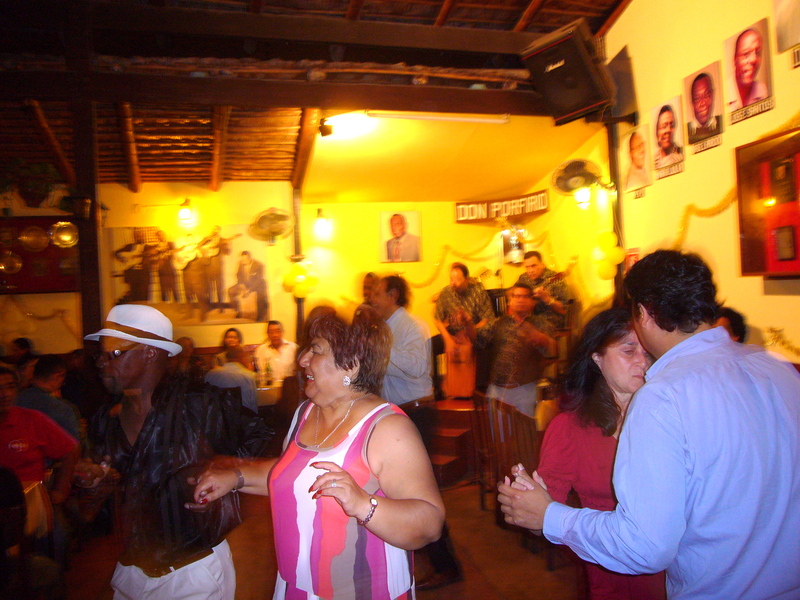 Historically, peñas were gatherings of musicians, often friends and family members, who would play for their own enjoyment and dancing. Over time, they have become somewhat commercialized, though there is still a loose, familial feel to them. The musicians are close-knit, and there is a strong emphasis on tradition. And though there are exhibitions of traditional dances, the emphasis is on dancing by customers. 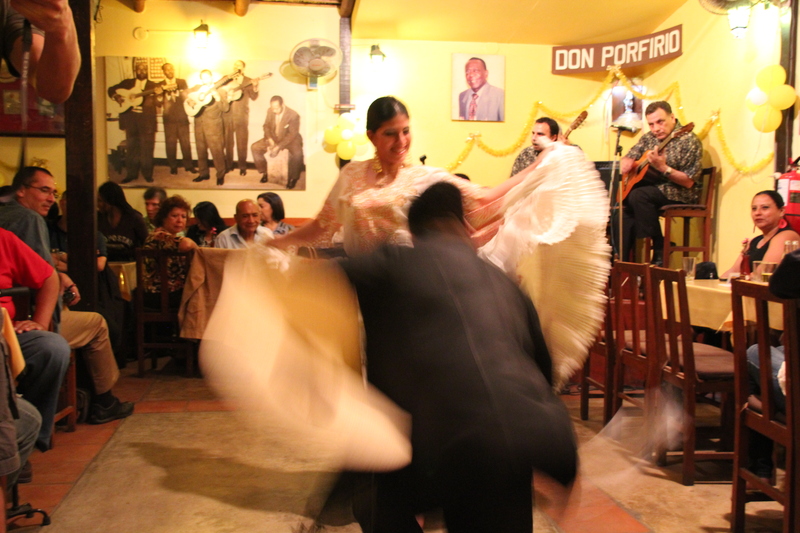 That is why it is so surprising that Alegría and Afro-Peruvian Sextet are welcome to play at Don Porfirio’s, albeit in a relatively short, thirty minute set. The evening started with the house band playing and a gentleman with a rich baritone singing as customers grabbed partners and danced to the complex rhythms. Whether in their 70s or 20s, couples smoothly moved their hips and their feet in time to the music. The resulting dance was modest, yet seductive in manner. After a few songs, a couple of exhibition dancers delighted the customers with very traditional dances including two versions of the Marinera, in which the man and woman both twirl handkerchiefs, with the object of the male encircling the female. 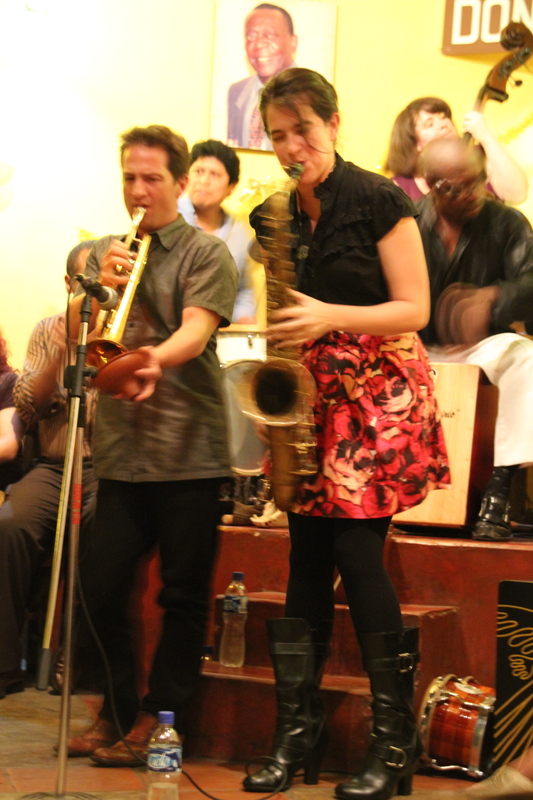 After some more dancing by the customers, the band took a break and Alegría and the sextet took to the stage. They opened with” Taita Guaranguito,” from Pucusana, their second album on Saponegro Records. It is performed in 12/8 time – a Landó – goosed along by the rhythms of percussionist Freddy “Huevito” Lobatón on cajón and cajíta, and’ Hugo Alcázar on drumset and cajon as well. Soon everyone in the room was clapping along in syncopation and shouting encouragement. Next up was “Puerto Pimental,” a slower number featuring lyrical contributions from Alegría, saxophonist Laura Andrea Leguía, and acoustic guitarist Yuri Juárez. Finally, the band performed “Piso 19,” alternating between 12/8 and swing time, with supple support from New York bassist Maeve Royce and Lobatón, leaving the stage to cheering and enthusiastic applause. Alegría and his band have received well-deserved accolades from The New York Times, Downbeat, and a number of Latin Jazz periodicals. Judging by the response of the audience at Don Porfirio’s, the band’s approach to Afro-Peruvian rhythms is gaining new fans among tradition-loving Peruvians as well. Stay tuned. This entry was posted on Monday, January 10th, 2011 at 2:31 pm and is filed under Uncategorized. You can follow any responses to this entry through the RSS 2.0 feed. You can leave a response, or trackback from your own site.